Here we are with another plant I saw at Lismore castle. Like yesterday’s romneya, it is a delightful plant for late summer colour and, unfortunately, is rather invasive. But this has a very different look and has a long season of blooms in brightest pink with a wonderful perfume. 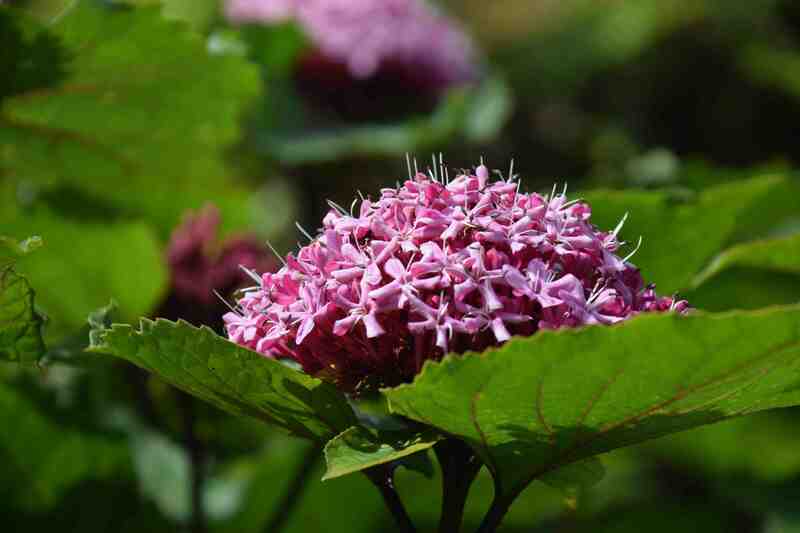 I have never known anyone use a common name for Clerodendrum bungei but apparently it is sometimes called Mexican hydrangea, which is odd since it comes from Northern India, or Kashmir bouquet which at least has some geographic accuracy. It is a slightly tender shrub that acts almost as a herbaceous plant in the typical northern European climate. From a spreading rootstock it sends up many vertical, rarely branching stems that are dark purple or almost black with pairs of large (about 25cm across) softly hairy, heartshaped leaves that are rich green and flushed with burgundy, especially in the shoot tips. In rich soil these stems can reach 1.5m or more before the head of deep pink buds appears in their tips and, usually, by August the first flowers are opening. They are delicious pink colour and wonderfully fragrant, a pleasing contrast to the odour of the leaves which is slightly unpleasant. 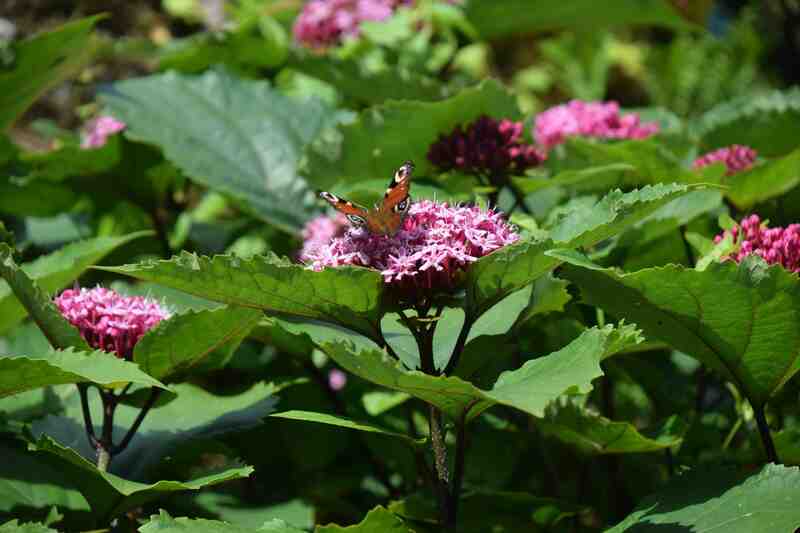 Not only do humans like the smell of the flowers but butterflies like them too. I call this ‘the other clerodendrum’ because the most desirable is probably C. trichotomum which is a small tree with clusters of heavily perfumed white flowers about now but which is most admired for the display of turquoise seeds set in crimson calyces that follow if we get a decent autumn. It can be a truly beautiful small tree if planted in a sheltered, sunny spot in sandy soil but I find it can be a but tricky to please. As soon as frost touches the plants the leaves dissolve and the plant looks pretty unpleasant in winter. Although the stems can sprout if the winter is mild it is best to cut all the stems down in spring and then give the clump a good mulch of compost to keep it growing strongly. In a warm, sunny spot in well drained soil it is an easy and rewarding plant but it will sucker and spread – you have been warned. Nice to be reminded of Clerodendron bungee. Another casualty some years ago. Perhaps time I tried again, though not a plant one comes across much in garden centres. I think it may be a bit tender/ tricky too.